Here in Canada, today is the Victoria Day holiday in which we celebrate the birthday of Queen Victoria. It's a statutory holiday celebrated on the Monday preceding May 25th. Her majesty's birthday was May 24, 1819. Most people just refer to it as the May long weekend. Normally, by the time the holiday rolls around, the snow and cold is behind us and nurseries are full of people getting plants for their home. Boats are brought out of storage and taken to the lake and cottages are opened up. Some knitters set aside their needles and don't knit during the warm weather, preferring to wait until the colder days' return (all too quickly, in my opinion). SOME knitters, not me. I knit year round. 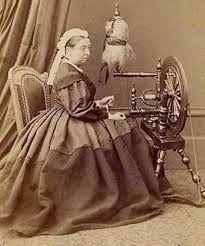 Queen Victoria was a knitter, crocheter and spinner. I wonder what she'd think of today's knitting with so many yarn choices, ways to connect with other knitters, patterns and tools. Queen Victoria is Britain's longest reigning monarch. I can't help but wonder if the soothing qualities of creating helped her through all the crises of ruling an empire. Many years later we heard Elizabeth Zimmerman's motto, "Knit on with confidence and hope, through all crises." I like to think that this way of thinking and life helped Queen Victoria. 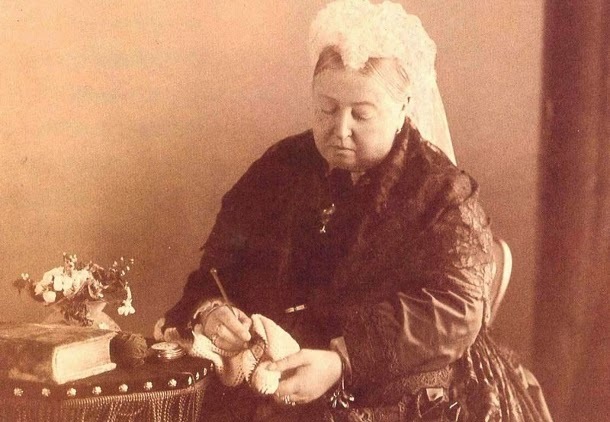 While blog-surfing, I found this knitted Queen Victoria. It's a cute likeness, well done!